Addressing the leftover meat, cheese, and vegetables in my fridge by tossing them together into a big bowl with cold pasta and dressing for dinner. Preferably a summer dinner. Or a summer midnight snack. I mean, was there ever really a better midnight snack than cold pasta salad? That’s it. These are the only places pasta salad exists in my life. But they are good and important places, especially that first one about the summer events that require a contribution to a community food table, and especially considering that here we are, at the end of summer! Wow. Time to cry into my pasta salad. How is already the end of summer? Okay. Let’s clear some things up here. I live in Minnesota, home of the church basement potluck and “salads” made from jello and whipped cream and Snickers bars. I AM ZERO PERCENT KIDDING. I grew up on salads made from candy bars and fake dairy and loved every blessed second of it. So when I think of pasta salad, even if the first image in my mind is some mayo-loaded retro bomb of deliciousness, I try to guide my mind to a vision of pasta salad that is more elevated. Pinkies-out style. You know, more classic and less mayo-y. A tiny bit retro, maybe, yes, just by default of being a “pasta salad” in our great state of Minnesota, but also something fresh and classic. Not modern – let’s not get too ambitious here. Just a quality classic pasta salad situation that you can be proud to bring to the party. These days I am thoroughly enjoying my pasta salad with WHOLE WHEAT pasta. Nobody even has to know, guys. This can be our pasta secret. It’s so chewy and delicious, and with the ridges on the outside of that penne? Ugh. It’s almost too basic to be good. ALMOST. This is a face plant moment just waiting to happen. May I offer one last tidbit of advice? You do not need to wait to be invited to a picnic or potluck to get some pasta salad magic in your life. This is a weeknight’s dream meal. Stop at the store on the way home and pick up some good salami and cheese, some olives, and a few fresh herbs. Cook up some pasta, toss it all together, and voila. Cold pasta salad + a glass of rose for dinner, and colder pasta salad as leftovers for lunch all week. I will be over in a flash. Use the code PINCHPASTA at checkout to receive 15% off your purchase of pasta at DeLallo.com! 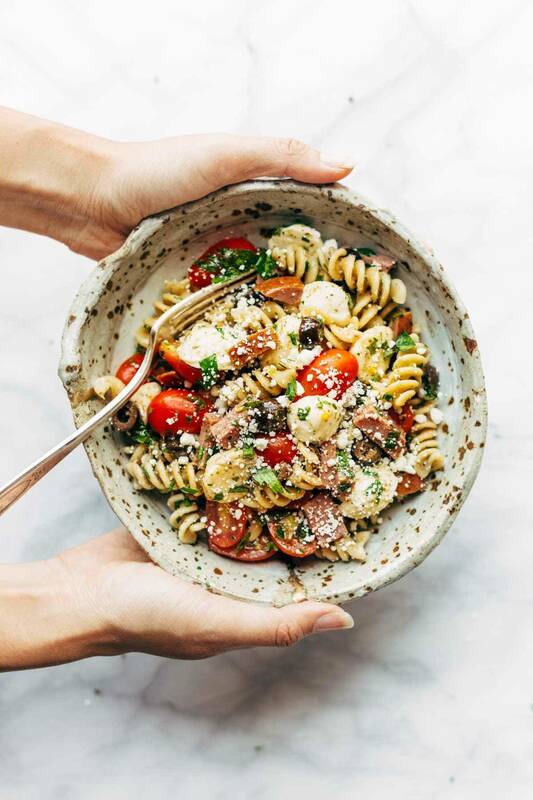 The BEST Italian Pasta Salad – with pasta, tomatoes, fresh mozzarella, spicy salami, parsley, olives, and easy Italian dressing. Super versatile to what you have on hand! Cook pasta according to package directions. Allow to cool slightly (and maybe toss with a little oil to prevent sticking). Keep in the fridge for 2-3 days. I think it actually tastes best the day AFTER you make it. Whisk or run through the blender to make a creamy, slightly thickened dressing. For a lower calorie, lower fat, and/or lower sodium version of this salad, scale back on the salami and add a few cups of additional veggies in its place (blanched green beans, fresh spinach, artichokes, red or yellow peppers, etc.). Thank you to DeLallo for making such delicious whole wheat pasta and for sponsoring this post! Love these recipes! Right up my alley. Absolutely delicious! . My husband’s comment was, ” it’s a keeper.” Thank you for sharing your recipe. Hi, was wondering if you think making this 2 days before a potluck would still be tasty? I won’t be able to make it the day before. Thanks! Hi Kat! I think that would work! If you want it to be really fresh, what I would recommend is to prep all the ingredients two days before, and then toss it all together the morning of the potluck. I woke up thinking, Pasta Salad! This looks fabulous and I went straight to the store. Grill up some BBQ chicken, put out this fab recipe, call the family for Sunday sit-down on the porch! YUM! Thanks! Have had other pasta salad recipes and this looks like a new version for me to try…big family picnic coming up so will add the table ! I just made the dressing for this salad and and at first taste, it seems *really* salty. Is this normal? If not, how can I cut it? I followed the directions…a whole tablespoon of coarse sea salt – should I have done a teaspoon instead?? You said crumbled feta was optional, so that means i can add tofu, a vegan substitute of feta, for this recipe, can’t it? From your rival city St. Paul! – so fun to find recipes from MN – was browsing summer salads and here you are. I am going to make this salad this afternoon – certainly is hot and humid enough to warrant it!, isn’t it. I doubled the recipe for a large gathering and there was barely a cupful left over. The dressing is fresh tasting and you probably have everything in your pantry! I used an immersion blender to mix the dressing and it turned out perfect. In fact I have the dressing ingredients stuck to my refrigerator door for easy reference. Thank you Lindsey! DID YOU TOP it with some kind of cheese at the end? I’m making a large batch of this for a shower… would you recommended making the day beforw of day of? Thank you! It looks really good, I hope I can do it justice for my family Spring Party! Hi Lindsayi!! love all the green things going on here!! Especially those super clean broccoli salad! Thank you and Keep it up. This pasta salad looks so delicious! This is one of the best ever recipe. Actually, I don’t’ like the pasta, but will make it surely at home using your tips. Thanks for sharing such a nice blog with us. This pasta salad looks which means that tasty ! This really is one of the better ever recipes . Really , I don’t’ like the pasta , and can make it surely at home utilizing your tips . Thanks in part for sharing such a pleasant blog around us . I know what I’m having for dinner tonight. DeLallo does make some pretty tasty pasta. Thanks for sharing this fantastic recipe. This looks so delicious and nutritious. I am a big salad junkie. Thanks for the recipe. FINALLY!!!! The Italian pasta salad I have been looking for. For years. Thank you!! I just love Pasta!! The way you have mentioning was outstanding!! I got hunger by just go through your blog!! Tasty pasta salad recipe! I had a ton of compliments for this recipe. I love everything in the salad and the best part is you can add whatever you want. I’ve added cucumber and it turned out to be a great addition to the salad. I’ve used the rotini trio from Rossi Pasta, which made my salad look colorful. The dressing only added to the dish. Very simple and delicious. Thank you for sharing! Making your pasta salad. Recipe calls for 1.5 cups of Italian dressing but the recipe you furnish for your homemade dressing only makes 1 cup? Is 1 cup adequate or do I need to make your recipe 1.5 times? Hi! This looks great. Thinking about making for a get together. Do you put the dressing on right before serving or does it taste better to put on the night before? Thanks! Everything looks yummy! It’s great to have some quick and easy pasta salad recipes. Thanks for sharing this recipe…..